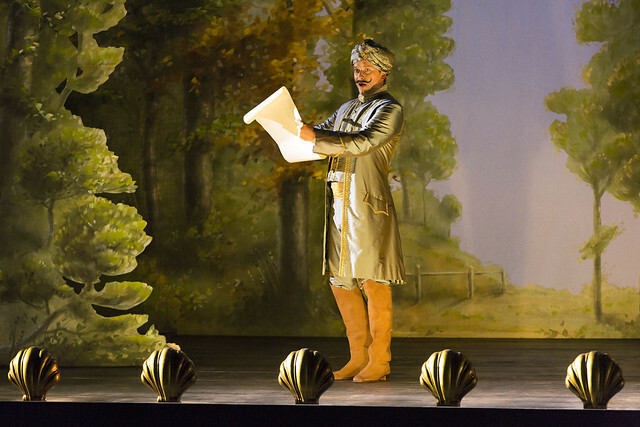 Jan Philipp Gloger’s new Royal Opera production of Wolfgang Amadeus Mozart's Così fan tutte will be broadcast live to cinemas around the world at 6.30pm BST on 17 October 2016. Download the Così fan tutte Digital Programme for free using the promo code FREECOSI and enjoy a range of specially selected films, articles, photos and features to bring you closer to the production. Ferrando loves Dorabella and Guglielmo loves Fiordiligi – but their friend Don Alfonso is sceptical. He offers the young men a bet: given the opportunity, their loves will prove unfaithful in less than a day. Fiordiligi and Dorabella are devastated to learn their fiancés are leaving to 'go to war', but are soon confronted with two handsome strangers (Ferrando and Guglielmo in disguise) who are looking to seduce them, in increasingly extreme scenarios – and with potentially relationship-ruining consequences. Interestingly, research reveals that the opera's wonderfully farcical plot is a result of the opera's creators, Mozart and Da Ponte, making the plot up as they went along! Così is the third and final collaboration between one of opera's greatest composer-librettist partnerships: Mozart and Da Ponte. While its credentials were promising, the opera's reception was far from positive following its 1790 premiere. After a rocky start, the opera is now accepted as one of Mozart’s masterpieces, no doubt due to an almost continuous stream of musical favourites throughout, including the terzetto ‘Soave sia il vento’ and the arias ‘Come scoglio’, ‘Tradito, schernito’ and ‘È amore un ladroncello’. 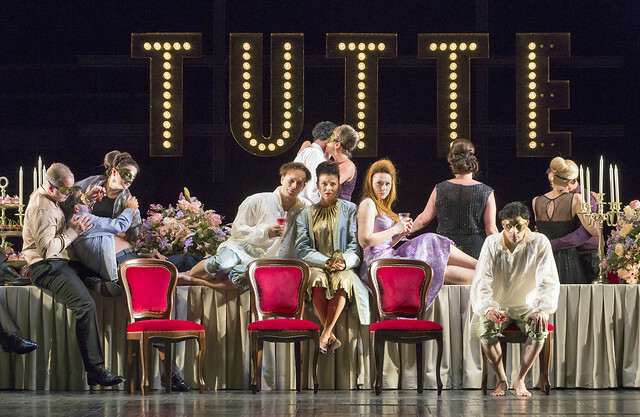 German director Jan Philipp Gloger makes his Royal Opera debut with this new production of Così fan tutte, taking their inspiration from Mozart and Da Ponte’s alternative title for the opera: ‘The School for Lovers’. Set in a theatre and playing on the blurring of acting and reality, Don Alfonso takes the lovers ‘on a theatrical, emotional journey’, where they, and the audience, learn important lessons about themselves and their relationships. Conducted by Semyon Bychkov, the cinema relay boasts a cast of up-and-coming stars: American soprano Corinne Winters as Fiordiligi, American mezzo-soprano Angela Brower as Dorabella, German tenor Daniel Behle as Ferrando and Italian baritone Alessio Arduini as Guglielmo. German baritone Johannes Martin Kränzle performs the role of Don Alfonso, and Spanish soprano Sabina Puértolas sings Despina. Così opened on 22 September 2016. Read audience reactions to the opening night and add your own review. After the relay, we will publish a roundup of audience tweets, so share your thoughts with the hashtag #ROHcosi. Is there a replay for this one? I have rehearsal Monday Nights! 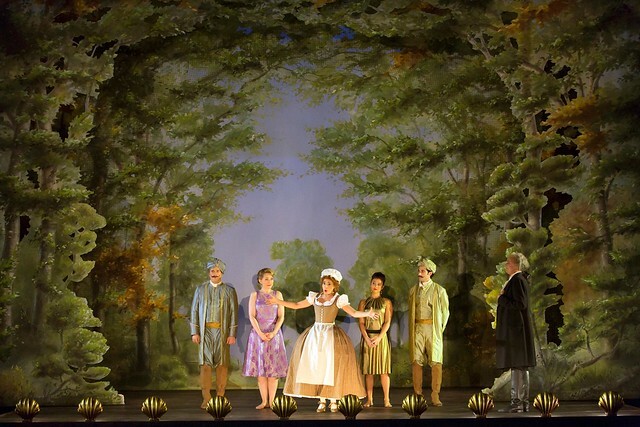 There is an Encore showing of Così fan tutte at some cinemas on 23 October 2016. You can find participating cinemas near you here by specifying the date. Pity about the 15 minutes of information-free gush that preceded the opera. Excessive use of superlative adjectives such as fantastic, fabulous, amazing, stunning, dazzling and dizzying ends up conveying absolutely nothing at all. And hearing bits of the overture several times before hearing the overture complete weakens its impact. Today we visited an Encore of Cosi fan Tutte in a cinema in Noordwijk (Holland). What a nice production, intelligent enscenering and verry good singers. We'r looking forward for Les Contes d'Hoffmann.